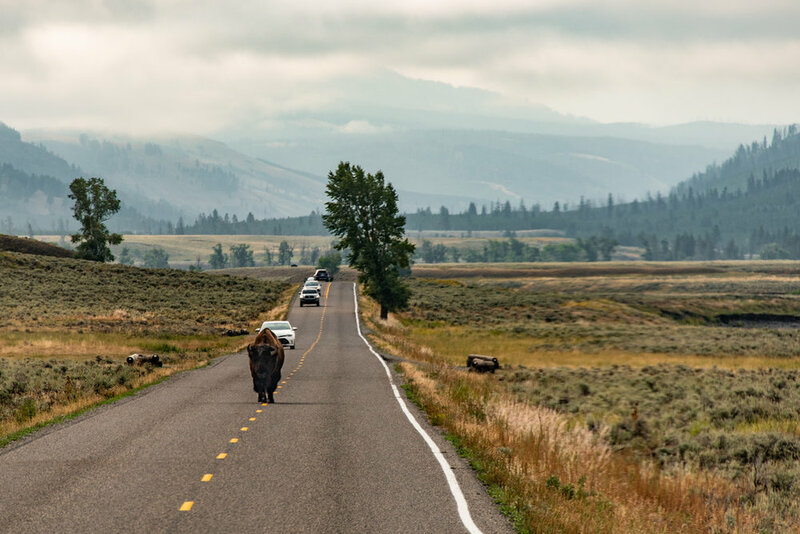 Oct 3 Yellowstone - A Land Of Roaming Beasts! 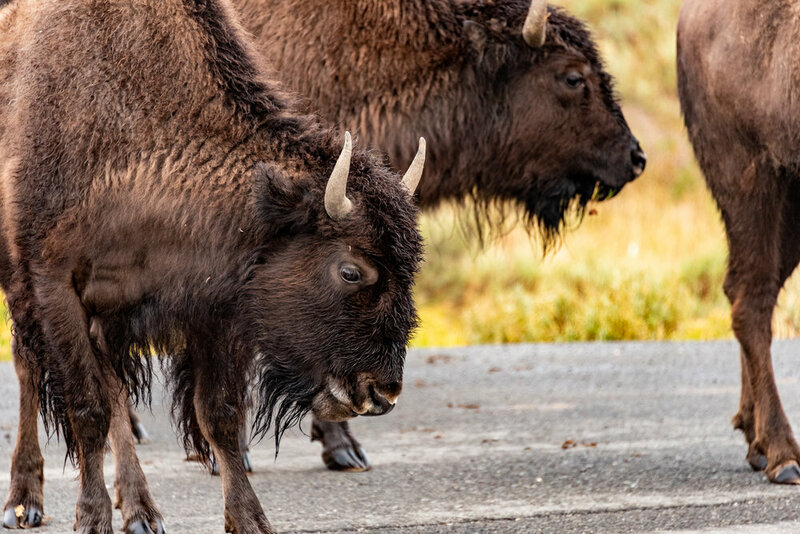 No trip to Yellowstone is complete without a wildlife encounter or two... we were not disappointed on our trip. This place is full to the brim with some amazing animals. 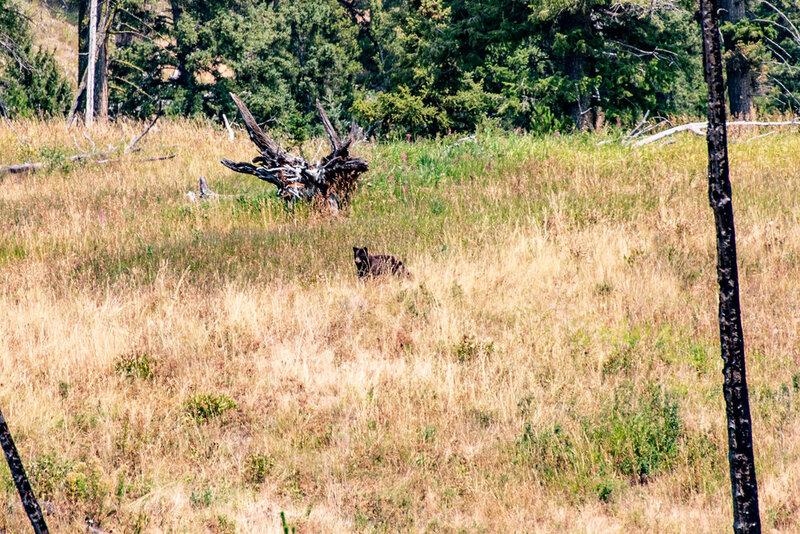 There are a couple of main areas in the park to see the wild beasts that roam the hills. This is the biggest area and most well-known for wildlife spotting. Located on the northwest side of the park, it is worth the drive to go see this area. The landscape is completely different from most of the other areas in the park. The valley opens up after driving along some winding hillside roads. The road stretches out in front of you, and just seems to go through green valleys forever. 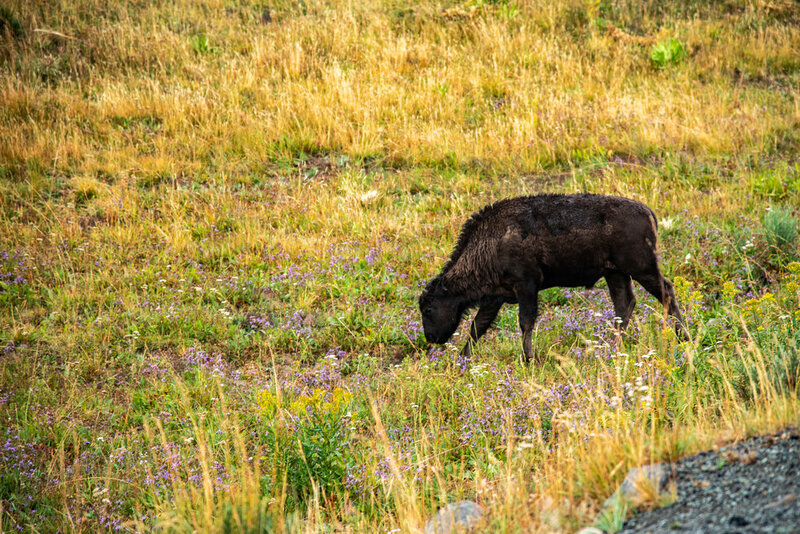 There are lots of convenient areas to pullover and enjoy the wildlife, which you will most likely encounter along the roads. On our trip, we got an early start and headed into the valley as early as we could manage. We were driving along those roads in thick fog as the sun was just beginning to light up the sky. We drove along to a good resting spot, and made some coffee to warm us up a little. We didn’t see much at this first stop, and wondered if we were just unlucky. We opted to drive along a little further, and wow, were we glad we did. Almost right after pulling into the street, a big bison strutted into the road and sauntered right towards us. We loved this guy just walking straight down the middle of the road, right past our van. We could have touched him from the window, he was so close, but of course we didn’t. It didn’t take long to come across more bison, then even more, and more. They just kept showing up on hillsides and off in the distance, but then they started showing up right next to the road. We loved getting to experience these massive wild animals in their habitat (but made a point to respect their space and that the land is theirs). Towards the end of our drive here, we pulled into a small parking lot and took a short walk. Much to our surprise, after just a short distance, we came up to a small valley and stream running in front of us, and it was full of bison. One in particular stood on a small hill, seemingly watching over his friends. We took a pair of binoculars on this trip, and they definitely came in handy. Being able to see these amazing creatures up close and in detail through the binoculars was super cool! One of our favorite moments this morning was seeing a big bison rolling around in the dirt. I imagine that he just had a bad itch to scratch, or maybe he was just having a fun morning playing in the dirt... either way... it was so fun to watch these huge animals just get down in the dirt and roll around! On our last morning in Yellowstone, we had planned to get up and have an easy morning and head back to Salt Lake to catch our flight. Right when we laid our heads down to sleep the night before, we had a wild idea that we should “YOLO” this moment, and go see what we could find the next morning. It was a very early start, but it was so worth it. We saw more bison here than we could even imagine, and they all really seem to like hanging out right along the road. We saw them running, kicking up dirt, rutting and make all kinds of noises, chomping on grass, and just standing around. It was a total “bison jam” and nearly made us miss our flight. It was totally worth it! We didn’t know anything about this little dirt road until we got to the park and noticed it on the map. We have a hard time avoiding most dirt roads, so we were intrigued by this little drive. The road was bumpy, but very well maintained for a random dirt road in this big place. We had gone the entire trip to this point without seeing a bear, so we just really hoped we’d see a bear playing in the woods or in a meadow here. We drove through and weren’t seeing any animals, but then we came to a small pullout with three cars parked in it. We pulled in and jumped out, only to see a little black bear rolling around in the grass off in the distance. I grabbed my zoom lens and loved watching him play and roll around. He seemed to be pretty young and very playful. This ended up being the only bear sighting we got on camera in the park, and we were glad he was very, very far away. I did see another bear on one of the early mornings driving around, but I didn’t have a chance to get a photo. 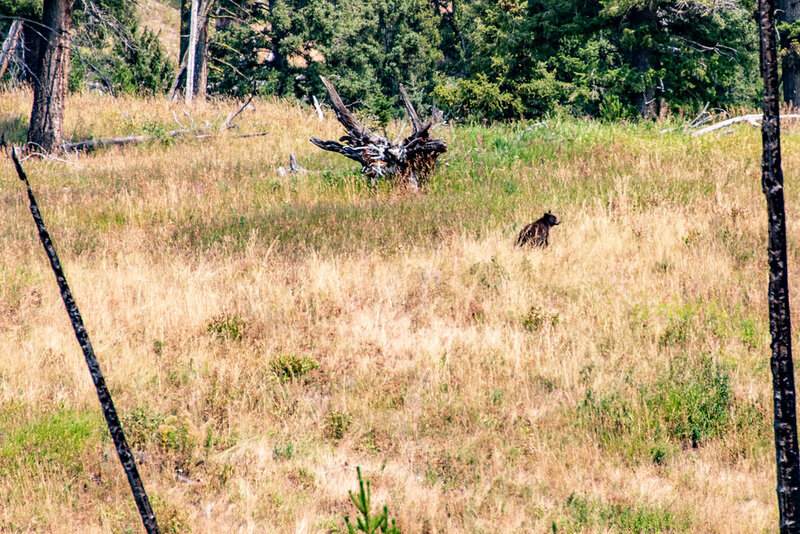 I’m fairly certain it was a grizzly, back in a small meadow, tucked behind a tree line. 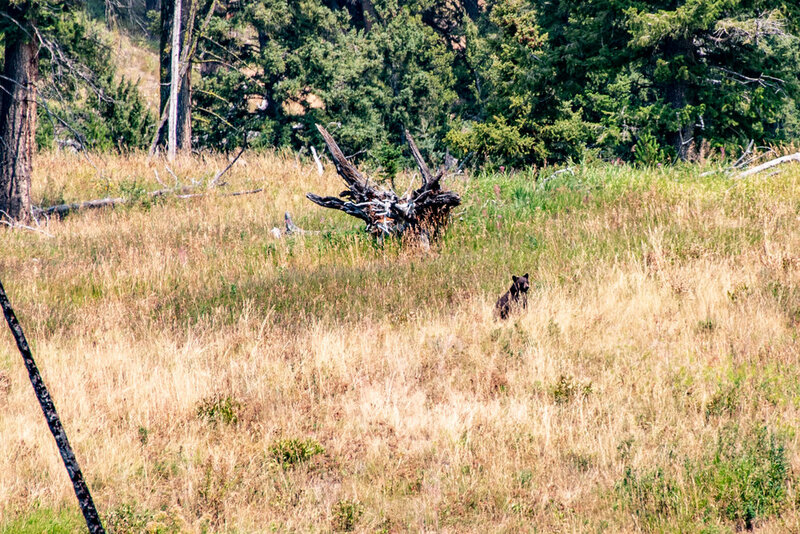 We were driving along and the tree line opened for a mere second, and I saw a big brown fuzzy creature off in the distance. We turned to go back and see for sure, but he was long gone. I’m fairly confident it was a bear, and a very large bear at that, so I’m going with grizzly! 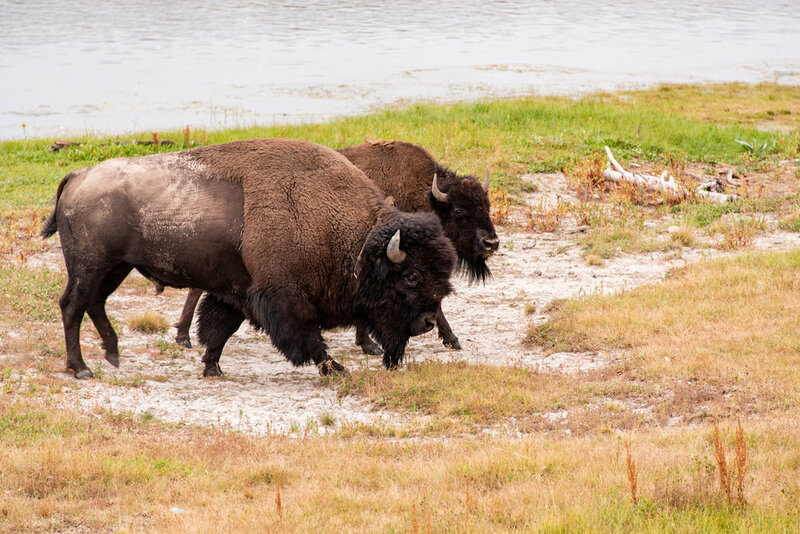 Overall, the bison are the creatures that slowly saunter around and let everyone get a good look. 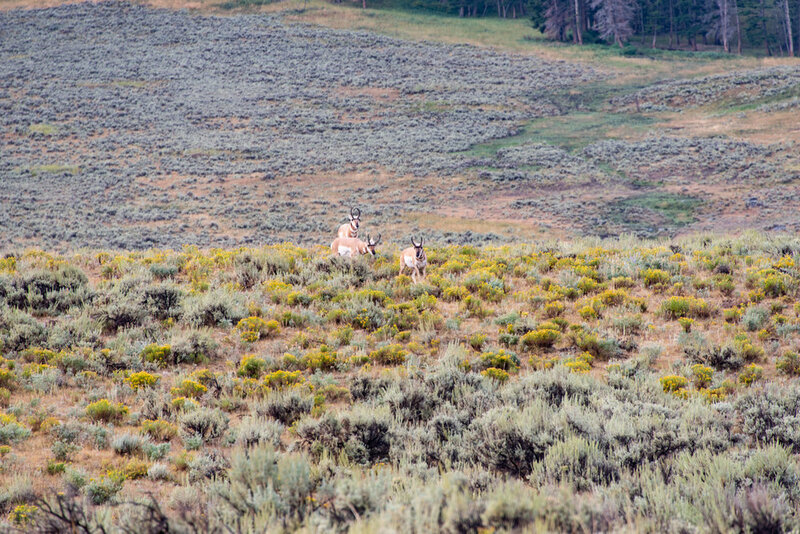 And there are so, so many of them, that it is amazing to see them just hanging out near roads and off in the distance. Oh, and they are BIG. 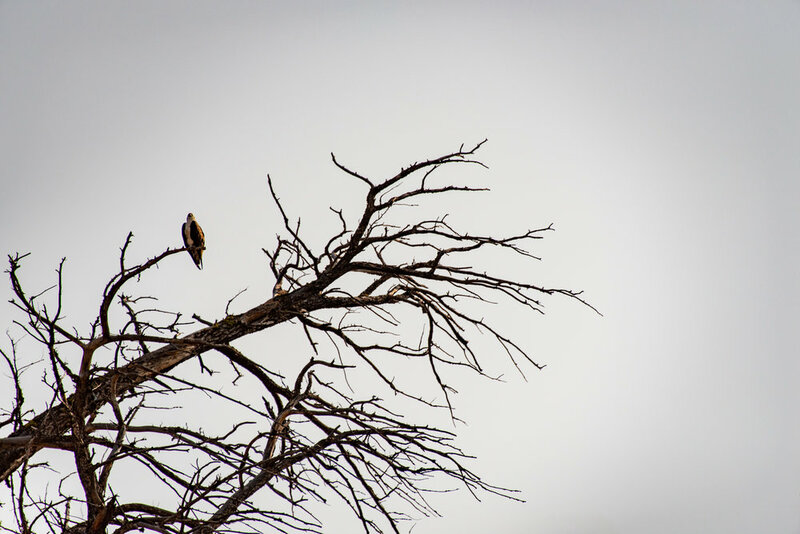 We saw a few other animals around the park - ospreys with a nest, pronghorns roaming in a field, very tall elk, and probably some other animals hiding in bushes. These animals were easily some of our favorites things about the park! The ospreys were cool - one was on one side of the road, the other way over a big ravine up in the big nest with some babies. We couldn’t see much of the babies, but got a great view of the big birds guarding their young! If you plan to go visit these wild animals, please be mindful of the parks direction on how to share the land with them. Keep a great distance, give them lots of space, respect that you are on their turf, and by all means, do not approach or feed the animals. They are wild. Take a telephoto lens and binoculars! Share your stories in our comments - what big beasts have you encountered in Yellowstone?